A conference held in Othmani Grand Mosque of Zahedan under the title of “solutions of Seerah to get rid of contemporary crises” on Dec. 24, 2016. 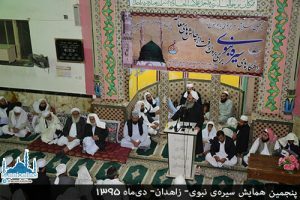 “SunniOnline” reported the fifth Seerah conference has been held by the Seerah Nabawi Society and the host was Farouqia Islamic seminary of Zahedan city. A number of scholars including Shaikh Abdol-Hamid and Mufti Mohammad Qasem Qasemi took part in the conference and talked to the audience, too. The chosen articles in Persian and Arabic were presented by their writers in the first session of the conference. Molawi Ubaidullah Barahoi, one of the senior teachers at Badr-ul-Uloom seminary delivered a lecture on ‘methods of studying & teaching the life of the prophet’. Molawi Behzad Feqhi, a well-known Islamic scholar from Khorasan region, talked to the audience of the conference. He urged the political, commercial, Jihadi and social morals of Muslims spread Islam in the beginning years of the history of Islam. Mufti Qasemi, the head of Darul-Iftaa Darululoom Zahedan, said in his speech that the beloved prophet Mohammad PBUH was dispatched as a prophet when the world was prone to a mass suicide. Shaikh Abdol-Hamid, the rector of Darululoom Zahedan, termed the life of the prophet PBUH the best exemplary for God-seekers. He said, “For reaching to Allah the man should imitate the teachings of the prophet PBUH”.